Make a statement with the bold lines and sleek color from this wide chrome four-light pendant. 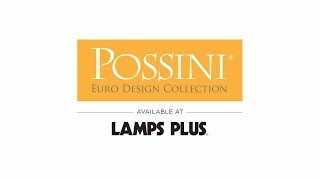 Dress up a whimsical living room with this four-light pendant by Possini Euro Design®. Constructed of metal mesh, the open cage-like shade displays a radiant chrome finish. Sleek and clean, the silhouette looks great in a variety of modern spaces and is sloped ceiling adaptable. 15 3/4" high x 15 1/4" wide. Canopy is 5" wide. Weighs 10.15 lbs. Uses four maximum 60 watt type A bulbs (not included). Lair four-light pendant by Possini Euro Design®. Chrome finish. Metal mesh construction. With a cage-like silhouettethis wide chrome mini pendant makes a bold statement.